You issued a purchase order to a vendor for an item. The vendor provided a receipt or invoice for your records. 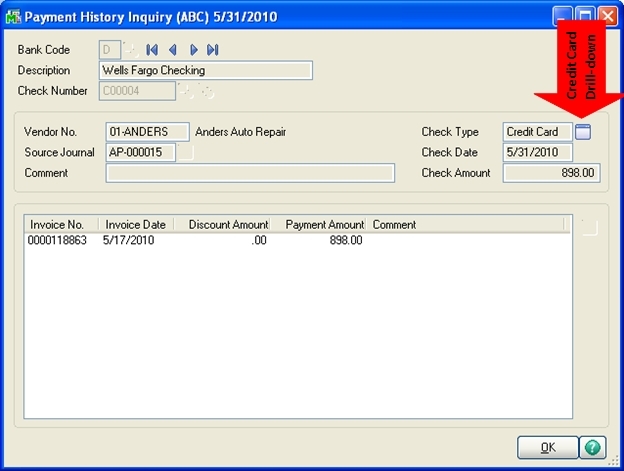 You followed the normal process to receive the item and receive the invoice in the PO module, and now the AP module shows that you owe payment for the invoice. This is as it should be. But, wait! You gave the vendor a credit card to pay for the item. Now the credit card statement arrives and the charge for the item is on it, so now the system thinks you owe the credit card company for the item also. What can you do? 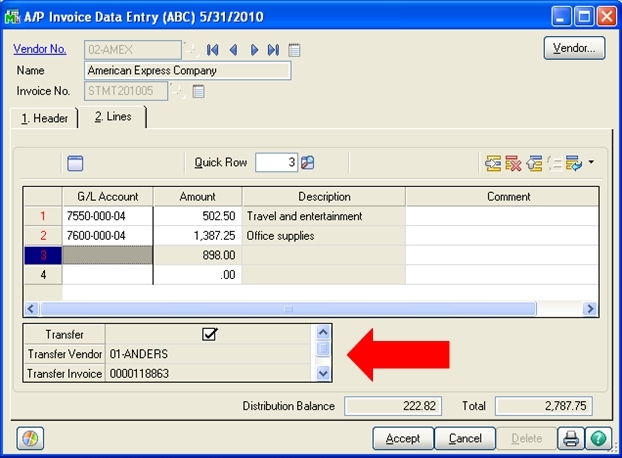 On the Lines panel, distribute the amounts to general ledger accounts as you normally do, BUT…when you get to the charge from the vendor, DO NOT enter a GL account. Instead, click the icon just above the G/L Account column field. 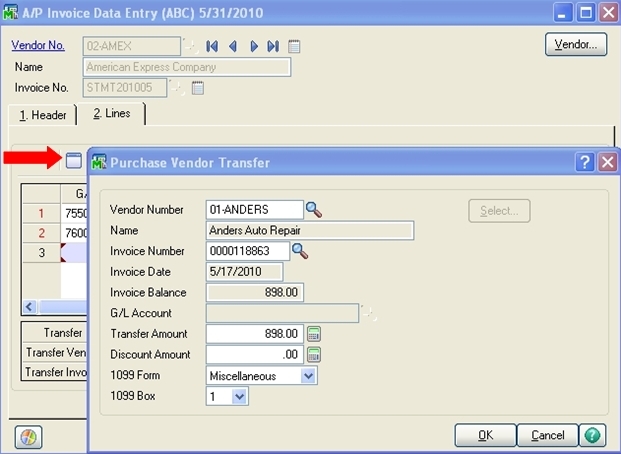 This is the Transfer Information button, and it allows you transfer the balance of an invoice from another vendor onto the invoice that you are currently entering. 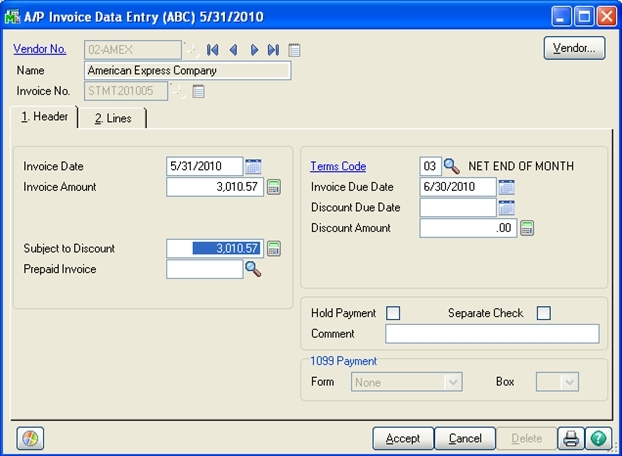 Select the Vendor Number and Invoice Number. 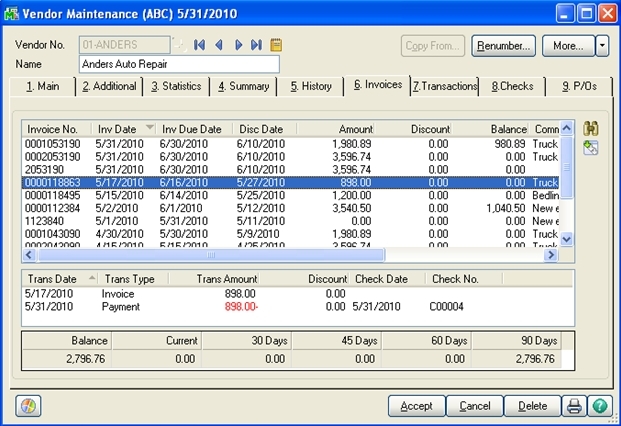 The full invoice balance will default as the Transfer Amount, but it can be changed if only part of the invoice was paid with the credit card. 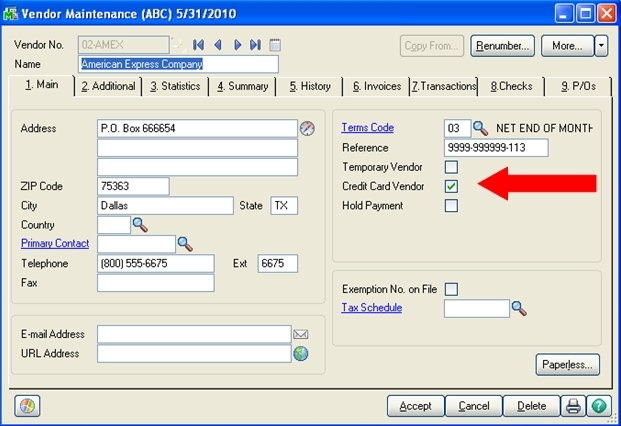 Then click OK.
For the transferred invoice amount, the G/L Account is blank, but the Transfer checkbox is on, and the “from” vendor and invoice are referenced. 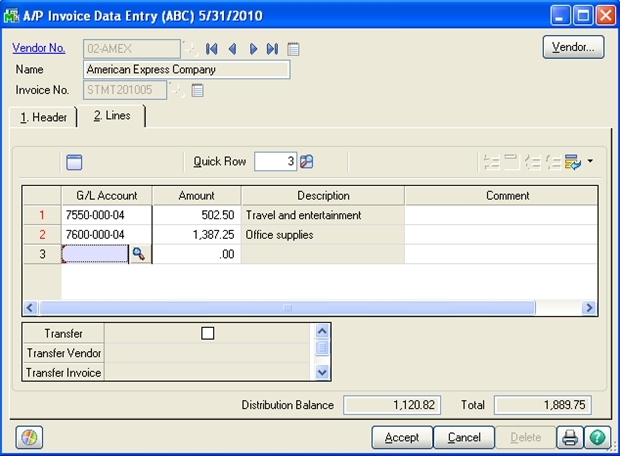 When an invoice is transferred from one vendor to another using this method, the Accounts Payable account is both debited and credited, so there is no change to the GL. But now, the balances on both vendor accounts are correct, and you have full visibility about where you bought the item, and how it was paid. Elegant! I followed the instructions above. 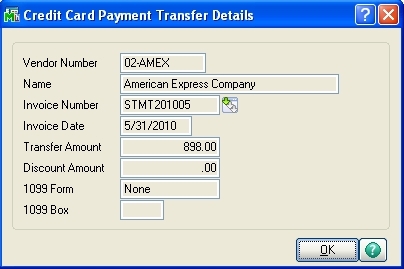 My question now is when I print out my check history report it lists the full amount that I paid to the credit card (which includes the vendor transfer amount) but it also lists the vendor transfer amount as a separate line item. Thank you.